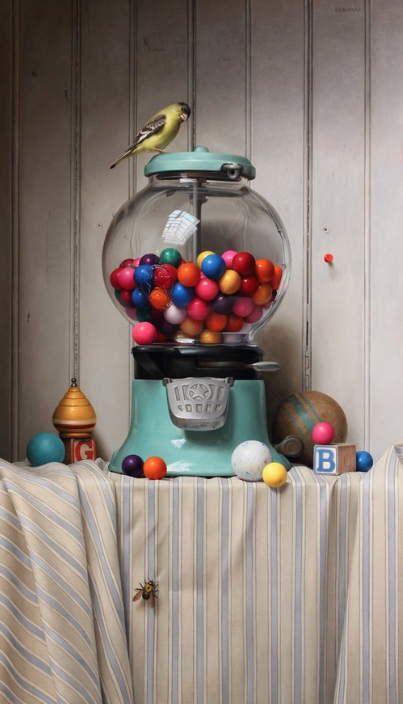 Still Life Painting is an important genre of art and a proven tool for teaching artists of every skill level the disciplines needed to create successful, beautiful paintings. The class will concentrate on many of the fundamentals of good picture making, from the technical to the conceptual with still life as the subject matter. 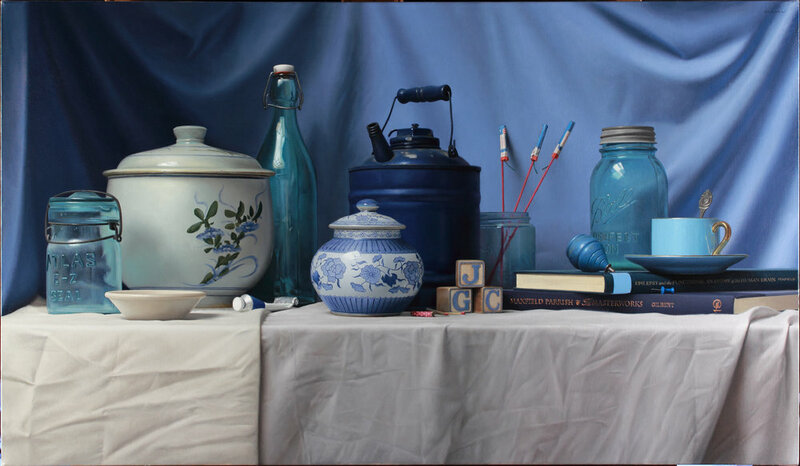 The class will have lectures and demonstrations focusing on different topics as well as individual critiques while the student paints his or her own still life set up. For those who wish to focus on the simple fundamentals of drawing and painting, there will be a set up consisting of geometric shapes & colors. Some of the principles discussed will be composition, accuracy in drawing, color and color theory, understanding form and modeling, edge control, glazing/scumbling techniques, lighting, materials and good studio practice. An all levels workshop but some experience drawing or painting is recommended. HOURS: 10:45-5:00pm Monday Through Friday. Still life painting is an important genre of art and is useful for honing seasoned skills or teaching beginners. This workshop will concentrate on the fundamentals of art-making, from technical to conceptual aspects, using still life as subject matter. Through daily lectures and demonstrations focusing on various painting and drawing techniques, individual critiques, and studio time, students will grow their skills in composition, color theory, form and modeling, edge control, glazing techniques, lighting, and materials. The concepts explored during this workshop can be translated to any genre of painting, giving participants a stronger foundation to carry-out their creativity. This Workshop will concentrate on many of the fundamentals of good picture making, from the technical to the conceptual with still life as the subject matter. The class will have daily lectures and demonstrations focusing on different topics as well as individual critiques while the student paints his or her own still life set up. Some of the principles discussed through out the workshop will be composition, accuracy in drawing, color and color theory, understanding form and modeling, edge control, glazing/scumbling techniques, lighting, materials and good studio practice. The work and knowledge explored during the workshop can be translated to any genre of painting. Personality and vision are important elements in creating art. Having the foundation to master your craft and carry-out your creativity is essential. For most of the history of art, color was thought of as unknowable, the province of only a gifted few. While great colorists might be born, an artist can gain an intimate knowledge of color space by understanding the three attributes of color…hue, value and chroma…and practice mixing each. A painter in his own right, Albert Munsell (1858-1918) used the terms hue, value and chroma in his numerical system of color naming. A numerical system, he thought, was more precise than the traditional names of color like ochre, crimson and ultramarine. For example, he would describe a certain yellow not as yellow ochre, but as 10YR 5/6 where 10YR is the hue, 5 is the value and 6 is the chroma. This three week course will introduce both the novice and experienced painter to the concept of controlled color based on the Munsell system. Week one, artist Graydon Parrish will teach each student how to mix every color within the gamut of oil paint. The second week, he will introduce the concepts of color matching, shading series and color sequences. This will enable the student to build successful palettes for any subject, real or imagined. In week three, artist Tony Curanaj, who has taught with Graydon for years, will test and refine the student’s modeling skills and offer creative ways to use color in composition. Students who have taken week one and two previously may want to start at week three. Graydon Parrish will be attending the beginning of week three so that all will transition smoothly. The class will concentrate on many of the fundamentals of good picture making, from the technical to the conceptual with still life as the subject matter. The class will have lectures and demonstrations focusing on different topics as well as individual critiques while the student paints his or her own still life set up. For those who wish to focus on the simple fundamentals of drawing and painting, there will be a set up consisting of geometric shapes & colors. Some of the principles discussed will be composition, accuracy in drawing, color and color theory, understanding form and modeling, edge control, glazing/scumbling techniques, lighting, materials and good studio practice. An all levels workshop but some experience drawing or painting is recommended.